Anna Kilponen was on the bus with Team Finland this past March preparing for an opening game against Russia at the 2017 Ice Hockey Women’s World Championship. Surrounded by her Finnish compatriots, her mind quickly shifted to her teammates in Grand Forks, North Dakota, whose college team was about to meet its sudden end. 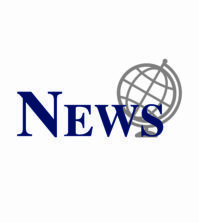 Kilponen was scrolling through Twitter and found out that the University of North Dakota (UND) was disbanding its women’s ice hockey in addition to men’s and women’s swimming and diving programs on March 29 to comply with new budget restrictions. Kilponen’s North Dakota (UND) teammates were on the ice practicing while the world got news that the university was cutting their team. It wasn’t until later that day when the players had a chance to meet with the school’s president and athletic director, according to North Dakota leading scorer Amy Menke’s account from The Players’ Tribune. At the meeting, the university attempted to justify its decision, but Kilponen says a lot of the athletes wanted more of an explanation. North Dakota has proven itself as a hockey school, leading the NCAA in game attendance with upwards of 11,000 fans on average for each men’s team game. While Kilponen acknowledges that the men’s team is more popular at the school, the women’s team consistently cracked the top five nationally in average attendance. Eliminating the women’s team became a blow to the entire sport. Kilponen and Team Finland went on to finish third at the Women’s Worlds, demolishing Germany in the bronze-medal game. Following the triumph, though, she quickly had to consider where she would play collegiately with two years of eligibility still remaining. She began exchanging emails with some of the top programs in women’s hockey, including Ohio, St. Cloud State and Mercyhurst. Quinnipiac popped up on her list and was a completely new name to her. 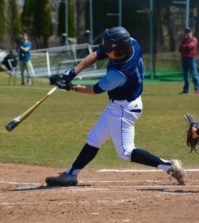 Turner and Quinnipiac had Kilponen come down for a visit this May and the junior defenseman was struck by the New England scenery. 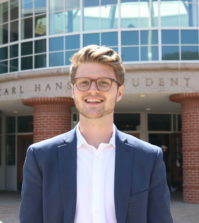 Kilponen moved to Hamden a few weeks before the fall semester began. Stepping into a brand-new environment, she laughed as she explained how she wasn’t completely lost. “Well I had a map, so I kind of felt like a tourist,” Kilponen said. The women’s ice hockey team emerged as her tour guides, and then closest friends on campus. Before long, Kilponen became an integral part of the closely-knit squad. 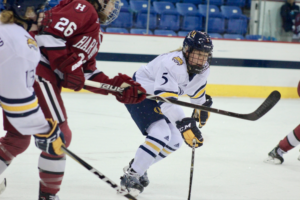 Between playing hockey and studying psychology, the school was the fit for Kilponen, and the acquisition became a fit for Quinnipiac’s women’s ice hockey team. 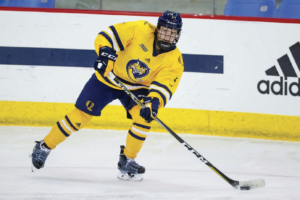 Kilponen did not come to Quinnipiac with just two years of play in the Western Collegiate Hockey Association (WCHA) and a trip to the Women’s Worlds. Back in 2014, Kilponen made it onto Team Finland and played at the Winter Olympics in Sochi, Russia at just 18 years old. 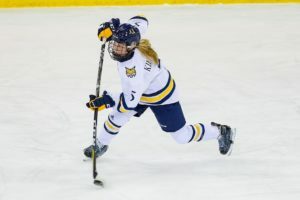 Kilponen notched two assists in six Olympic contests, but even though she has performed at the pinnacle of women’s hockey, she says she hardly discusses it with her Quinnipiac teammates. The former Fighting Hawk has meshed with the Bobcats in the early part of the season. Through seven games, Kilponen has one goal, two assists and praise from her head coach. One area where she has emerged is special teams. Quinnipiac is 8 for 37 on the power play this year, good for 14th in the nation, and Turner cites Kilponen’s ability to shoot off the pass as a reason for why the team is that high. 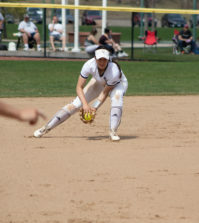 As the team begins facing ECAC foes, Turner is confident that Kilponen can continue evolving. The Bobcats will be without Kilponen for some upcoming conference play. The Finnish defenseman is set to head down to Florida with her national team to compete in the Four Nations Cup, a pre-Olympic tune-up tournament between Finland, Sweden, Canada and the USA. Kilponen will not say that she has a spot on the squad for the Winter Olympics in PyeongChang, South Korea this February, but she is looking to avenge an underwhelming showing in Sochi.